What Day Of The Week Is September 19? 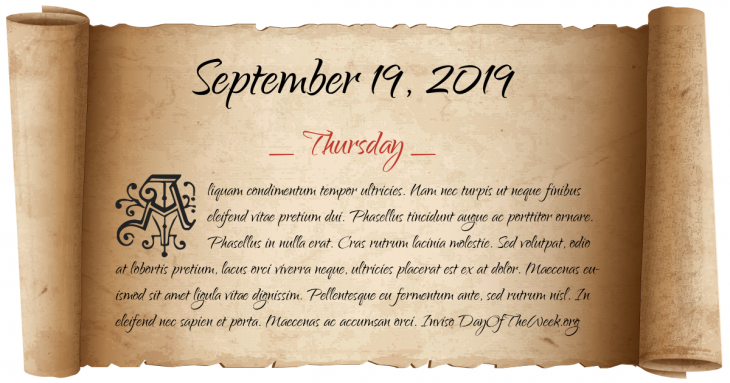 September 19, 2019 is the 262nd day of the year 2019 in the Gregorian calendar. There are 103 days remaining until the end of the year. The day of the week is Thursday. Battle of Poitiers: an English army under the command of Edward, the Black Prince defeats a French army and captures the French king, John II. U.S. President James A. Garfield dies of wounds suffered in a July 2 shooting. Lord Haw Haw (William Joyce) is sentenced to death in London. Montagnard troops of South Vietnam revolt against the rule of Nguyen Khanh, killing 70 ethnic Vietnamese soldiers. Who were born on September 19?